Sociology, the most important tech Tree. Ok, so in this thread I want to talk about adding in some of my personal favorite pet peeves fixes to the MOO2 game. We all know Sociology as the weakest tree in the game (or perhaps better, branch), and at the same time we see some rather glaring examples of things done wrong (or not done at all) in MOO2. Here I will ask folks to discuss the ideas for inserting new techs into this branch, to both "flesh it out" and to give us a place to but together all the disjointed thoughts and ideas about different ideas and such that anyone can come up with. Leader Techs = allow players to research a series of techs that allow for 'building' one's own Custom Leaders, that can be one of several different types, focused upon the 'weak spots' within the game and also adding new, original content to different areas of the game. New buildings = allow players to construct new building, that allow players to construct new units, and research new Techs. So the path that I am wanting here is: Research a new Tech, build the new Building, and then be allowed to build a new unit & open up the ability to research other, new Techs. This would open up the idea of some planets being able to build stuff while others, lacking the right building, being unable to build that same stuff. This idea is not new, as 2 examples of this in game are Marine Barracks = Transport ships, and Star Bases (or better) = Warships of Cruiser size and up. Drat, off to work. More latter. And then we can see how things go from there. Edited by voidstalker_woe, 07 February 2016 - 07:25 PM. I want to have leaders for things like ships and planets, naturally, but I would also like diplomatic and espionage leaders, as well. Also, I would like to have a much greater range of diplomatic status' within the game, so several unique states of 'alliances', and fixing the problem of allies going to war. Additionally, I would like to see a much greater depth put into place for intel and general knowledge, with the goal of keeping things a mystery, as much as possible, for as long as possible. Can anyone help me to be able to post MOO2 screen shots here? Or is that not allowed? I think it would be very much easier to achieve my goal of getting my ideas across, if I could SHOW what I am trying to describe/achieve. I use drop box as the image host program, and wonder if that is the source of the error message I have been getting. It says something like "link to a site not allowed" or some such thing. I had not thought to much along those lines, but being able to post what I have so far put into an image file would make this process way easier. IIRC, the Construction list has 12 levels, and not trying to exceed that is one of my goals. 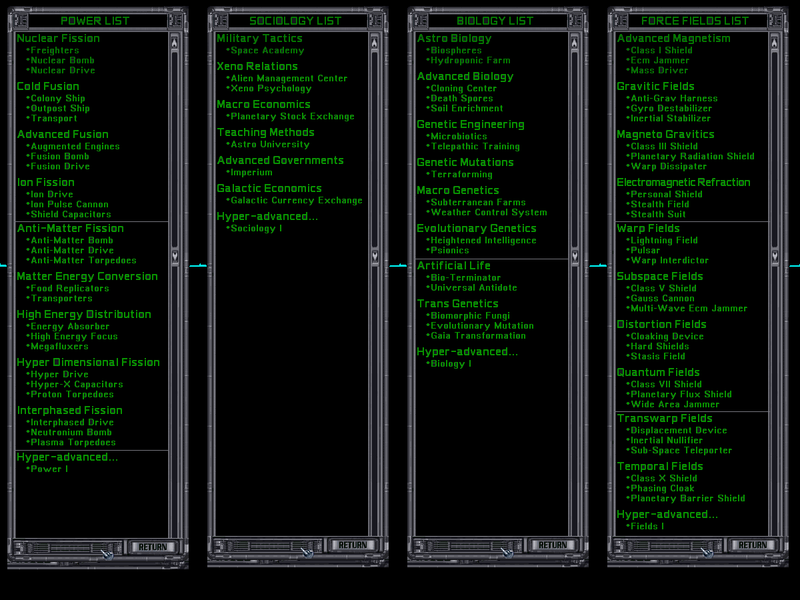 OTOH, Sociology has only 6 levels, with just 7 techs total as is, so if we wanted to make each level a tough choice, and have no more than 12 levels, then that would still leave us with 29 available tech slots with limiting each level to just 3 choices. 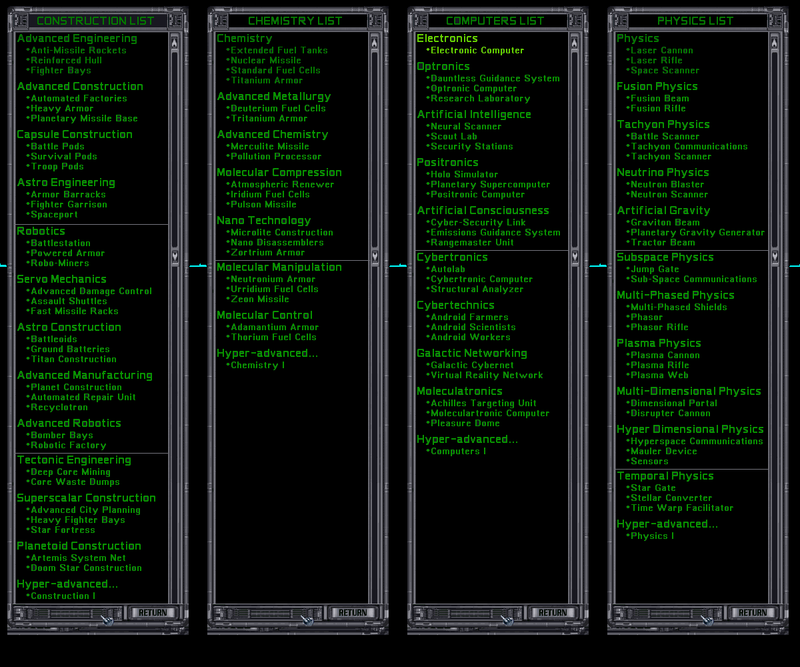 If we went ahead and allowed more than three tech in a level, but say limited it to 4-5 choices then we could come up with as many as 12-24 more additional choices, for a total of somewhere like 36-60 total techs slots, of which just 7 are currently taken. I suspect that initially, that would seem like a whole lot, but down the road a year or two, that would probably be deemed insufficient at some point. I am going to start a "Breakout Thread" to focus on treaties, whose enabling tech(s) would be found in the Sociology list. Also, at this point I would love to point out that if I were the guy in charge, any changes to MOO2 would be presented as OPTIONS (which were quite limited), to allow for different players too customize these settings to tailor the rules to their own preferences. Basically, instead of just making changes that folks may or may not like, just build in options, and let the players play the way they want. I don't see how one could go wrong if they keep the game just like it was back in the day, but allowed many new and interesting optional features, to allow customization of expanded features to match ones interests and play style. I really need to know how to post in game screen shots to show what I intend. HELP. Edited by voidstalker_woe, 07 February 2016 - 07:19 PM. 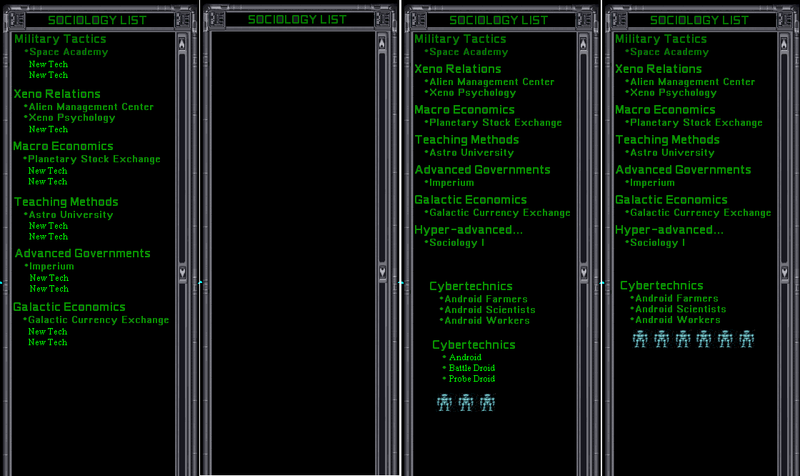 Ok, so here is a really basic template of the Sociology list, with just 6 levels, but a uniform 3 Techs per level, along with an empty list of equal size for tilling out with all the Tech that folks suggest in this and the related threads. This is just a very crude tool, so don't get turned off to the idea because of the way this initial image looks. I just wanted to be able to provide a really quick image that can be rapidly improved and modified to get to the point where it would kinda make sense to folks. What can be done for the Sociology list can be done for all 8 lists of course. In fact, I have all eight if anyone wants to start their own work using these images. Some Suggestions for the Sociology List. - Q Ships - Your Transports are now armed with 1 missile shot of your best missile type -1 level with no mods. - Native Communications - Natives now produce an additional +2 Food each. - Improved Diplomacy - You are now treated as if playing on 1 difficulty lower for Diplomacy purposes. - Improved Linguistics - Repulsive race language deciphered! You now treat Repulsive races as normal ones for Diplomacy purposes. That is a nice little list there, but I had some questions on how some work or worked differently than in game. I have all the techs in huge images, but I don't have the costs for the various levels, how can I best get the two together, post the huge images, and have someone else edit in the RP values, or maybe just have someone post the values and I can then edit them in myself. So, I think too big to share like this, maybe have to cut this down to 1/2 size. Again, too dang big, would it be better to post things showing the RP costs, like "Here are the 400 RP choices in all the fields" kind of thing, or do they really line up that way? Let me know what you all think, and if anyone wants to do the work editing and re-posting these, feel free. If no one wants to spend their time that way, but has the RP costs for all of the levels, just post those costs here and I'll do it. I like what you guys have done here! Edited by voidstalker_woe, 10 February 2016 - 11:00 PM.